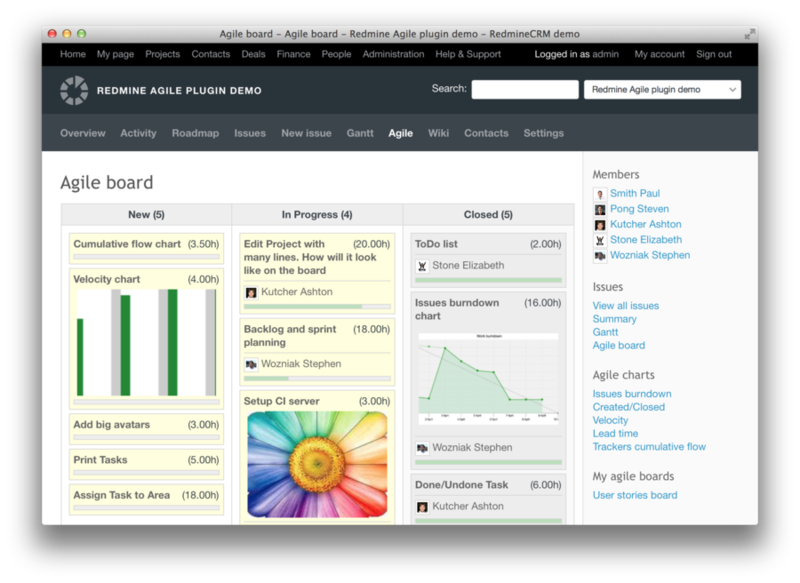 Your Agile whiteboard in Redmine. Track issues, prioritize them, and appoint assignees smarter and faster. Move pieces of work with drag & drop. 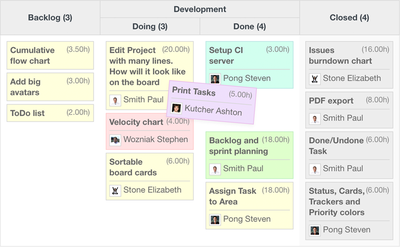 Comment, interact with checklists, and add issues straight on the board. It can be configured for Scrum, Kanban, or mixed methodology. It's workflow aware and will not allow unpermitted status transitions. Use one of 11 charts: Burndown, Cumulative Flow, Velocity, or Lead Time. Quickly visualize current status and track the progress of your projects. Use it to respond to any unforeseen circumstances in your development process. 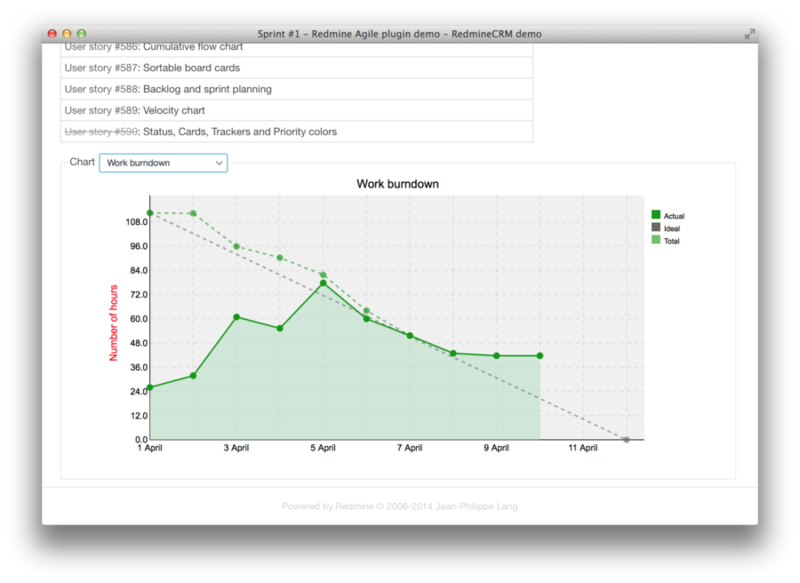 For example, you can estimate the likelihood of achieving a Sprint goal with Burndown and Burnup charts by tracking the amount of work remaining in a given sprint. Use charts to see a current and ideal distribution of work. With the Agile plugin, you can duplicate any phase of your projects or processes using columns and subcolumns. You can also use swimlanes to arrange and separate issues by parent tasks, asignee, tracker or other. Sprint planner allows you to see which issues belong to a particular sprint (or version) and reassign them effortlessly among sprints and backlogs with split view. A Sprint is a set of features and fixes that you will release as a single update to your software product. --Andriy Lesyuk in "Mastering Redmine: Second Edition"
I am working in a non-profit. We teach project management for students. I asked Redmineup for their pro plugins for non-profits and they helped me out. These plugins are awesome. The Agile plugin was especially impressive. Fully recommended! 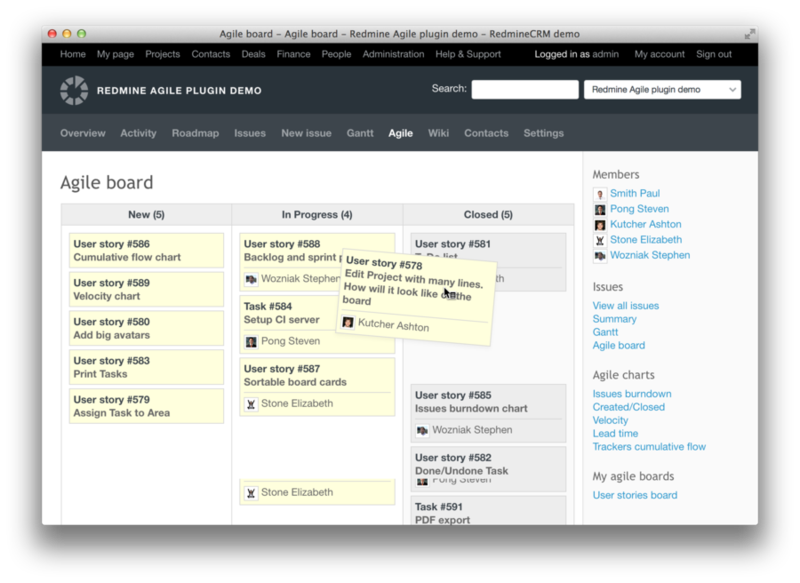 Our software development team relies on this superb plugin to manage our agile process. The graphs, boards, and grids are very customizable, making it a pleasure to work with for our unique combination of Kanban and Scrum techniques. We are using this plug-in and really like it. Easy to install, easy to work with. 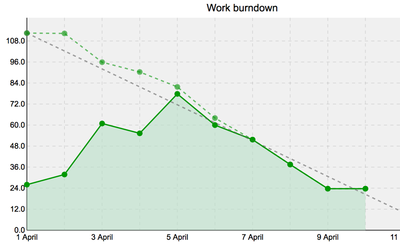 We like at our agency cubetech the work burndown chart a lot. So you can see at any time if the project is on track. Helpful! Thanks RedmineUP! Can't find a way to change default sorting order when new issues go to the bottom of columns but pretty impressed with dragging functionality, thanks! I like the idea what the majority of diagrams don't really explain themselfes and I miss customization at different aspects. The company should really invest some time and money into a good user documentation. I would like to know please if there is no risk to install this plugin with a plugin already installed . in this case with this plugin " redmine_issue_detailed_tabs_time V0.0.7"
Good deal, even though you must pay for all features. 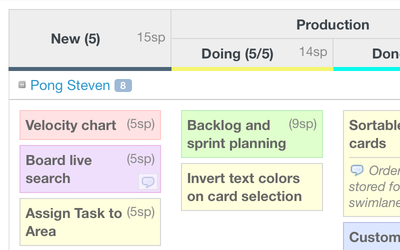 Very promising and might get better than backlogs in the future, but in its current state almost unusable for Scrum. 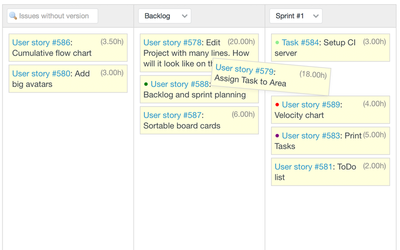 No real backlog, no story point estimation, creating a sprint and defining a sprint backlog is painful. The free version is beautiful, useful and smart. They also have a non profit organization plan, which is very cool. Throw in 'group by' for versions and other custom fields and this would be amazing. Came out of freaking nowhere and is already the most professional-looking and crisp of the board plugins. Now I'm torn between this and Backlogs. Just missing the "sprint" feature, but very nice plugin.